This Stainless Steel Wire is preferred by professional jewelry designers because of its high flexibility. Unsurpassed in strength, softness and flexibility. It has no tension and therefore will not produce an unsightly "corkscrew effect". This ideal all-round Stainless Steel Wire combines excellent strength and flexibility and is good value for money. It has no tension and therefore will not produce an unsightly "corkscrew effect". Good flexibility and strength are the characteristics of this Stainless Steel Wire. Unsurpassed in its wide range of colours, it is economically priced. A necklace - knotted or not? When a pearl necklace breaks, not all the individual pearls fall out. knotted necklaces lie much more beautifully against the contours of the body and accentuate the individual pearl much better. even over longer periods there will be no significant visible gaps between the individual pearls and stones. pearls, stones and accessories don't rub against each other. When using a Bouillon (French Wire)? 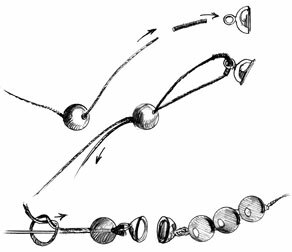 To give your necklace a neat and professional finish: pass the thread through the Bouillon, also known as French Wire or gimp, at the ends of the silk thread. This protects your jewelry against breaking at the clasp. 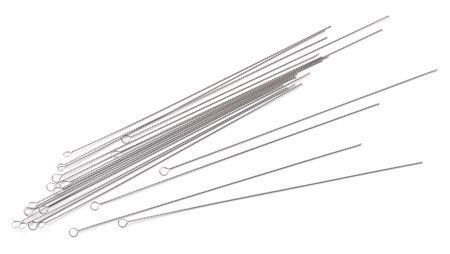 How do I use Beading Needles? Always choose the size of the needle according to the thickness of the thread. Therefore GRIFFIN offers three different needle sizes. Always use a needle made of twisted wire as other needles can damage the thread. After threading, carefully close up the eye of the needle with small pliers (e.g. GRIFFIN Flat Nose Pliers), to enable the needle and double strand beading cord to pass easily through the holes in the pearls. How do I knot Illusion Cord or Jewelry Elastic Cord? Illusion or Jewelry Elastic Cord can be knotted at the ends. In order to let the knot disappear, in a pearl for example, a somewhat larger hole has to be drilled in one of the pearls. Alternatively, a hollow bead can be used. 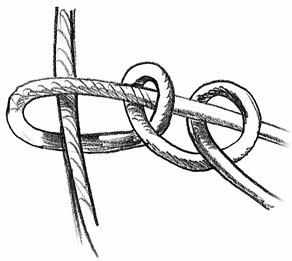 Make three half-knots and pull them tight. 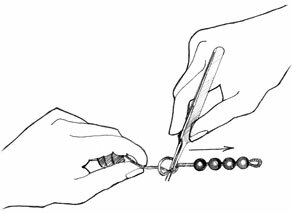 It is important that you make these knots with cord under slight tension to prevent unwanted gaps between the pearls/stones. How to work with Crimp Tubes? Position the Crimp Tube and pulled through wire in the second oval of the Crimper (the one with the dip), and close the pliers firmly around the crimp You will see it curl. Turn the Crimp Tube to ist side, position it in the first oval, and close the Crimper around the Crimp Tube again, so that you are compressing the curled Crimp into a rounded shape. Now the Crimp Tube is secured on the Stainless Steel Wire. How do I fix Wire Ends?